Thirty-seven retreatants of Samten Oseling Retreat Center, a branch meditation and practice institute of Namdroling Monastery, completed the traditional three-year three-month and three-day retreat on the 1st day of the Third Month, 2136 (26 April, 2009). These retreatants are the eighth cycle to complete the traditional retreat since the inception of the center in 1985 by His Holiness Penor Rinpoche. 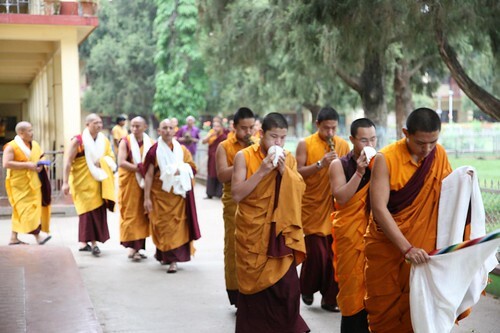 A month later, on 25 May, 2009, a new set of monks entered retreat. The practitioners emerged from the sequestered retreat grounds very early in the day and formed in a procession behind incense bearers and monks sounding religious instruments. The graduates then gathered at the residence of His Holiness Karma Kuchen Rinpoche, principal head of the Palyul Lineage and Twelfth Throneholder of Palyul Monastery, to whom they offered khata and the nectar of their accomplishment siddhis. His Holiness Karma Kuchen Rinpoche met with the graduates and offered them heartfelt advice to benefit their present and subsequent lifetimes. Afterward, the graduates proceeded to Tara Temple to recite the Prayer to the Eight Noble Auspicious Ones, and they were offered sweet rice and butter tea to mark this auspicious occasion. The monastery Gekho (disciplinarian) also presented the graduates with khata and monetary offerings. After prayers of dedication concluded the ceremony they returned to the retreat center. Later that morning the retreat graduates went to Zangdog Palri Temple to pay their respects to His Holiness Penor Rinpoche’s Holy Body (Kudung), and to recite the Bodhisattva Vow, dedication and aspiration prayers.